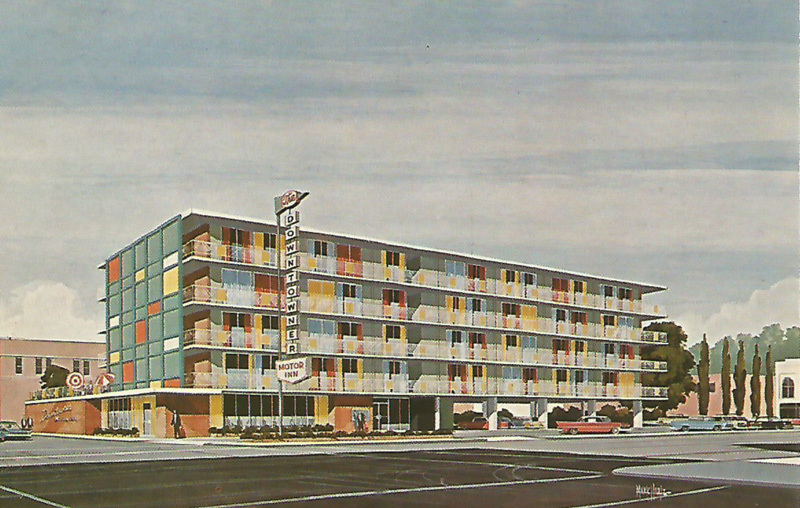 Architect’s rendering of the not-yet-quite-built Downtowner Motor Inn, corner of Center and Shelby Streets in downtown Kingsport. It was announced in the Kingsport Times-News in 1960 and was probably open for business in 1961. Having a Downtowner was a big deal at the time. The only other one in Tennessee was in Memphis. This one lasted until the early 1990s. At some time in the 70s, I took my mother to the restaurant there to have breakfast. I found a cockroach in my biscuit. Pancake House and then changed hands several times until it mostly went belly up in 1993. When I first came to Kingsport in 1956, this lot was empty. You could look out the back door of the Kress building and see the old City Hall on the west corner of Shelby and Center. Hinch Gilliam had a cab stand up on the Market-Shelby corner on this lot. There must be hundreds of copies of this card. They’re all over the web for sale at prices ranging from $10 to $24 each. I probably paid a buck when I bought this one a decade or so ago. This entry was posted in Bob's photos, Kingsport TN ephemera and tagged Downtowner Motor Inn Kingsport TN, Hinch Gilliam, Kingsport Times-News, Perkins Pancake House on July 5, 2015 by Bob Lawrence.